A just society in which everyone has an equal opportunity to achieve economic security and community prosperity and a just financial system in which everyone-- including lower-wealth persons and communities, and people and communities of color-- can safely and sustainably borrow, save, and build wealth. Create a just financial system in which lower-wealth persons and communities and people and communities of color can achieve economic security and community prosperity. 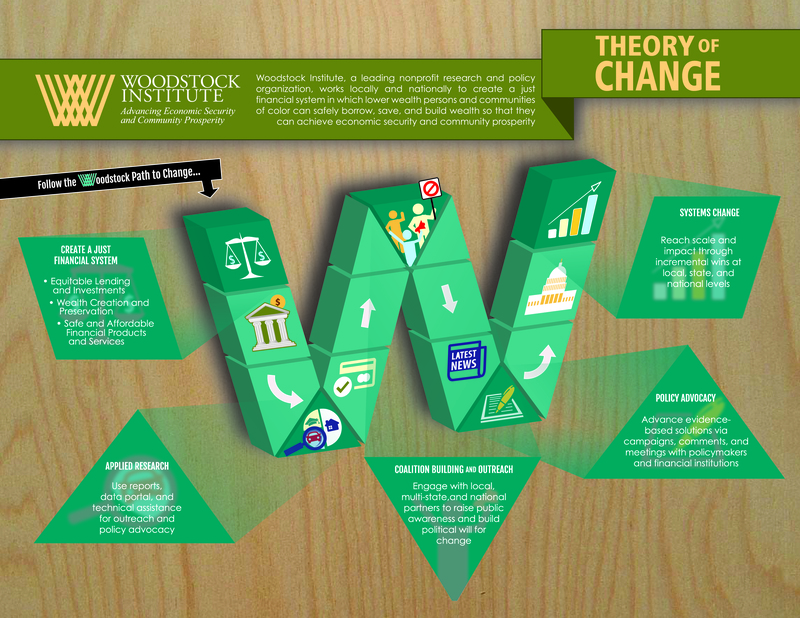 Woodstock Institute is a leading nonprofit research and policy organization in the areas of fair lending, wealth creation, and financial systems reform. Woodstock Institute works locally and nationally to create a financial system in which lower-wealth persons and communities of color can safely borrow, save, and build wealth so that they can achieve economic security and community prosperity. Our key tools include: applied research; policy development; coalition building; and technical assistance. Woodstock Institute has been a recognized economic justice leader and bridge-builder between communities and policymakers in this field since it was founded in 1973 near Woodstock, Illinois. Now based in Chicago, we work with community and philanthropic groups, financial institutions, and policymakers. Funded by foundation grants, consulting fees, and charitable donations, we conduct research on financial products and practices, promote effective state and federal policies, convene a coalition of community investment stakeholders working to improve access to credit, and help people use our work to understand the issues and develop and implement solutions.